Audio Technica ATH-ANC70 noise-cancelling headphones launch with SonicFuel in-ear range | What Hi-Fi? Audio Technica has released details of its new ATH-ANC70 noise-cancelling headphones, the successor to the ANC7B over-ear headphones in the Quiet Point range. Also new is a six-strong range of SonicFuel in-ear headphones set to cost from £35 to £75, and featuring foam, ear-moulding tips, that aim for long-term comfort alongside sound quality. The Audio Technica ATH-ANC70 Quiet Point noise-cancelling cans cost £149 and include an in-line mic and remote built into the ear-cup, plus an "anti-tangle", detachable cord. The ANC70’s have been designed specifically to be worn for extended periods and feature foam ear-cups designed to maximise comfort, but also reduce exterior noise interference. The headphones, which feature a new 40mm driver, sport a set of AAA batteries that should be good for around 40 hours. The ANC70s will work in passive mode, too, should you run out of juice. You get a hard carry case, a 0.25 inch jack adapter and an airline adapter, they also come with a set of AAA batteries. The Audio Technica SonicFuel line up also features a flat “anti-tangle” cord complete with an in-line mic and remote control, compatible with most smartphones and all generations of iPod, iPad and iPhone. 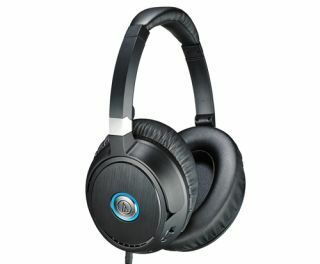 The headphones are available in black and silver and feature an all new driver design, that, according to Audio Technica offers “outstanding sound, whilst using very little power”. Recommended retail prices for the SonicFuel models are as follows: ATH-CKX9is £75, ATH-CKX9 £70, ATH-CKX7is £60, ATH-CKX7 £55, ATH-CKX5is £40, ATH-CKX5 £35. The new Audio Technica ATH-ANC70 headphones and SonicFuel range of in-ears are on sale now.